Derry Weaver is actually Nik Venet, who also supplies the howls and barks. So, is that saying that Nik Venet was impersonating Derry Weaver, or, is that saying that they're the same person with two names? According to page 25 of the Badman book, the union log lists Derry Weaver as attending the session. I've read elsewhere that some believe that Weaver played the leads on Moon Dawg, not Carl. IS DERRY WEAVER ACTUALLY NIK VENET, as quoted above ? I don't really see how. Nick Venet did the dog howls on both the Gamblers (Derry Weaver's band) version, and the Beach Boys version. Maybe that's where the confusion lies? the guitar playing sounds pretty similar but it's nothing young Carl couldn't have learned in two or three days tops. interesting fact, Bruce Johnston plays piano and sings on the Gamblers version. Which poses more questions...... Let's see....the Gamblers didn't record for Capitol, so Nik was at their Moon Dawg session at World Pacific solely on his own as a producer/director (that's what the record label says). Given Venet's 'history' with the song, it sort of begs the question...Did Venet introduce Moon Dawg to the Beach Boys, or was it just a coincidence that it was already on the Beach Boys set list. Vague as it is, the statement "Derry Weaver is actually Nik Venet" seems to imply that they are the same person. This is Derry Weaver. Obviously not Nik Venet. One website has THIS to say about Derry and Nik. "Sometime during 1962, Nick Venet hired Derry to work with him at Capitol Records ; Nick was A&R man and Derry assisted him for about four years, working with The Beach Boys, Glen Campbell, Lou Rawls... Once again, he has never confirmed that he played on some of the early Beach Boys tracks which would appear on the 'Surfin' Safari' LP." So, either the statement in the book by Doe/Tobler is a pretty bad typo, or it's completely wrong. It's possible that I'm misinterpreting the statement, but in my view there doesn't seem to be much wiggle room. It says what it says. I've tried to see how it could mean something other than what it seems to say, but I can't. Clearly Nik Venet had some investment in both Derry Weaver and the song Moon Dawg. Say what you will about the Surfin' Safari album's song writing, there's some rather slick lead guitar all over that record. Could Carl have become THAT polished in the few months since the rudimentary clunky guitar strumming heard on the Hite Morgan recordings? I'm sure if Derry Weaver was the lead guitar player on that album, we would have heard it multiple times over by now. One would think so, wouldn't one? Could this be the 'Roswell' of the early early Beach Boys ? We've seen pictures from the Capitol sessions showing Brian on bass; we've seen Dave playing guitar and we've seen CARL playing bass. BUT.... (correct me if I'm wrong) I don't recall any pics of CARL actually playing guitar during those sessions. More detective work needed. (until then, it's Carl, of course). Promotional pictures don't mean anything. There's a pic of Mike playing guitar, too. I knew somebody was going to point THAT out. ...but seriously, were those pictures actually taken for promotional purposes? Or are they casual pictures drafted into use on the albums? They certainly don't give the appearance of being professional promo photos. You can't really say that 'promotional' pictures dont' mean anything. All pictures mean at least 'something'. Let's be realistic. 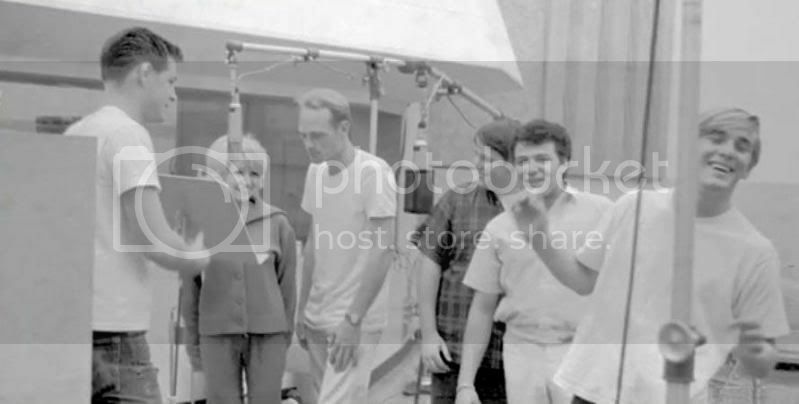 There was a number of pictures taken at Capitol while the Beach Boys were recording. The boys are wearing t-shirts and jeans, and some aren't even wearing shoes. Now, I ask you. If Capitol, Nik Venet, Ken Veedor or even Murry Wilson was planning on promotional pictures for the album cover, do you really think the boys would have been asked to come barefoot in t-shirts and jeans? No. Yet, for one reason or another, those images did make the back cover of Surfin' Safari. But they also appeared months later on the Surfin' U.S.A. album too - quite inappropriately I might add, since the Beach Boys didn't even look like that by the time of Surfin' U.S.A.
All of which tells me that what you refer to as promotional pictures were afterthoughts at best and cheap production values at worst. In other words, whoever was in charge of jacket design, laid out the front covers nicely, but when it came time for the back cover, it was "GULP..we need some pictures, now! Quick, look around! Somebody grab some beach boy pictures fast!" Therefore, even though Mike's holding a guitar, I believe these pictures are real non-posed candid photos, very much different from the bulk of totally contrived real promotional pictures, such as the ones you see on their other albums like SDV2, Surfer Girl, and the Beach Boys Christmas Album, and on virtually all their 45 record picture sleeves. Just because we see Dennis dancing with somebodies girlfriend, that doesn't mean he was boinging her. But he probably was. Nice image from same set. Hi Nik, you sly moon dawg! Watson, did you hear this? Larry Taylor later with Canned Heat. It's amazing how FEW picture there are of 'The Gamblers'. Problem with that is - there have been more than a couple bands using that name. AND, my original question remains. What does the author mean when he says that "Derry Weaver IS Nik Venet" ? Nik is shown playing guitar in other shots from that batch, so he's the "mystery" lead guitar player. Doesn't mean that lineup was actually recorded, though...anything can be staged for the camea, and these shots all look like typical messing-around shots. I notice that David is hitting a B & F# on the A and D strings and Carl is hitting B on the E string. Could they have been running through part of a song for the photographer? yeah... difficult to speculate as to what song they might be playing based on chord positions. Problem is, tracks were often sped up mechanically, which changes the key. Speed change tricks were used alot, to accomodate vocals and to achieve desired results overall. They might have been running thru a song for the photographer (Ken Veedor) or they may actually have been recording. My guess is they are NOT recording; but they may have been in the process of recording and stopped for a snapshot. It's probably an instrumental (which would be Moon Dawg) since Mike has the sax out. 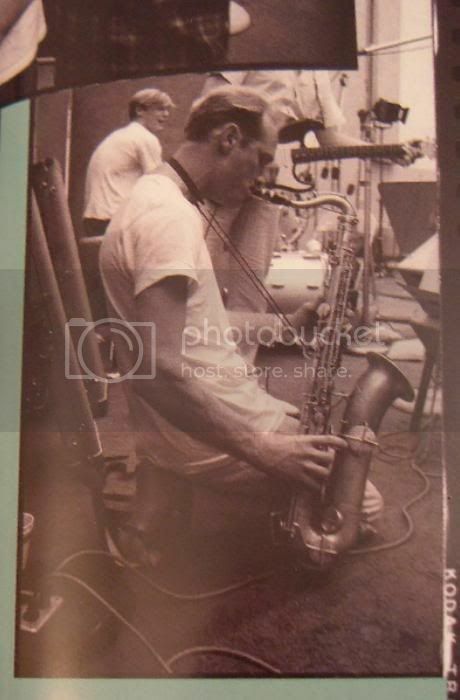 No, there isn't any sax audible in the recording, but that doesn't mean he wasn't playing the sax. If you''ll notice, his sax is not mic'ed. The amps are mic'ed, but not the sax. My theory is that although Mike wanted his sax to be part of the song(s), the sax was carefullly mixed out of the final release versions. Mike played Sax on Miserlou too, but you can't hear it on the final track on Surfin' U.S.A. d. It's there, you just can't hear it. The engineers were able to mix that song down clean without all the hooping and hollaring and the sax. That's one reason so many 'critics' have trouble with the Beach boys reading of Miserlou. They claim it's too sterile with no fire. Actually, the Beach Boys were totally wailing on the track, just like they were on Surf Jam. Differnce being that they decided to leave the 'room' mic ON when they mixed Surf Jam down for the final release version. Can you imagine Surf Jam WITHOUT all the whooping and hollaring? That's the 'room' mic, which was dialed IN when they mixed Surf Jam. They dialed the 'room mic' OUT when they mixed Miserlou. They shouldn't have, but they probably had to because Mike's sax playing was not so great. So. 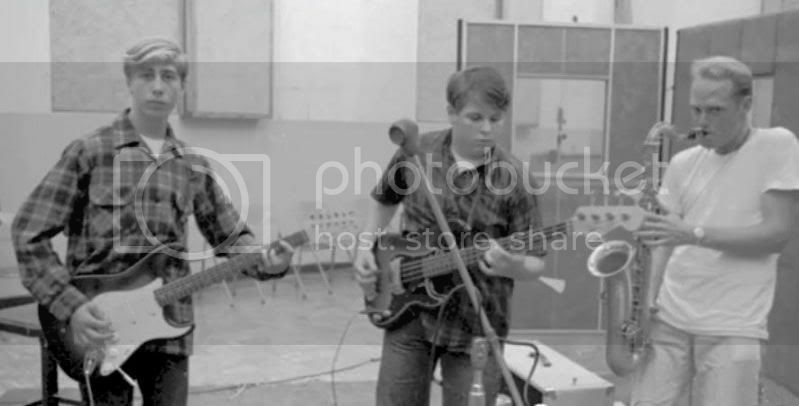 For any doubters, here's proof that Carl wasn't always playing guitar at Capitol during the Surfin' Safari sessions. For reference, here's a previous shot of Nik standing with the boys. Probably during vocals for 'County Fair'. And, here's Nik playing a Stratocaster with the Beach Boys. Nik's head is covered by the lower corner of another photo (strategically placed??) but unless Nik let somebody else wear his clothes, and has his body shape, then there's really no question. Still waiting to find out why the author says that Nik Venet and Derry Weaver are the same person. Maybe it's too difficult to twist out of. I seem to recall hearing many years ago that Venet claimed he used Weaver's name as an alias after Weaver died so that his family could receive some royalities (or something like that). Then it turned out that Weaver was still alive, and a lot of Venet's stories unraveled as being not-so-true (like the one that had Brian singing lead on the Basil Swift version of "Farmer's Daughter"; we know now it's Danny Hutton). Thank you. Good to see that somebody is willing to step up to the plate. Which is more than can be said for 'the author' who shall remain nameless (AGD). Yet, even this information doesn't explain 'the authors' vague and evasive stance. Hiding under his desk ? Are there other errors or omisions in said book ? "Complete" Guide is an oxymoron...there are other mistakes in this handy little book. Wonder if it will be updated in the near future? I'd bet there'd be a lot more answers on this topic if this could get moved to the General section. Why is it in the media forum anyway? The thread includes a couple of pictures but the original post is just an inquiry about a song, with no photos, sounds, or links. Andrew we need to know! Powered by SMF 1.1.21 | SMF © 2015, Simple Machines Page created in 0.328 seconds with 22 queries.